Cranberries and Canadians. Both are cute and hardy. Cranberries survive in cool temperatures and thrive in conditions that most other plants don’t do well in: acid soil and few nutrients. Canadians survive in extreme weather and thrive on hockey and beer. Cranberries grow in sandy bogs or marshes and are popular in Ontario, British Columbia and the Maritimes. Canadians grow in all sorts of weird and strange places and are popular all over the world. Cranberries float. Canadians aren’t so big on floating but if we keep gaining weight we may just give the cranberry a run for its money. Because cranberries float and grow lower to the ground marshes are flooded when the berries are ripe to make harvesting easier. Growers use water-reel harvesting machines to loosen the cranberries from their vine. Then the berries are corralled onto conveyor belts and into waiting trucks which take them to receiving stations, processing plants and eventually onto your table this Thanksgiving. Cranberries contain antioxidants specifically polyphenols, which are known for their cancer fighting properties. 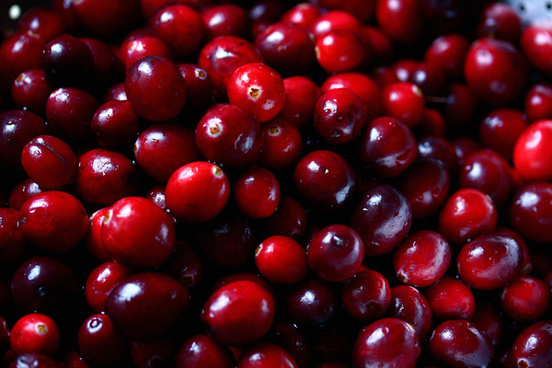 Cranberries may also help to prevent urinary tract infections, heart and gum diseases. Avoid soft, crushed, or shriveled berries. Fresh cranberries will keep in the refrigerator in a perforated bag for 4-8 weeks. You can substitute frozen cranberries in most recipes calling for fresh.